" I can also see colors much brighter and I see well into both short and long distances. This and the high quality work of the eye clinic basically made my decision for me. I would like to take this opportunity to thank everyone again for a very high quality care and professionalism. " When I first found out, that I was diagnosed with cataract, it scared me a little and I perceived my vision getting weaker very fast while reading – which is a great problem for me when I need to look for a phone number in my phone or a response in the script. My world did not change with cataract, but I did notice seeing some colours more yellow. More than a year ago, I made an appointment for the first consultation at your Eye Clinic, and because my eyes are the most important part of my body to me, I could maybe imagine not being able to walk, but I cannot imagine not being able to see. I was afraid of the surgery and backed out, but I am satisfied today. 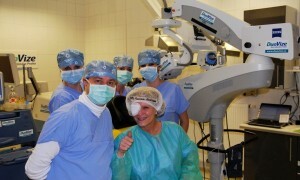 The cataract surgery was performed with the newest, most modern method, with the LenSx laser. It is a novelty, an eye lens that makes vision into all distances possible. What is beautiful is the fact that now, I can also see colors much brighter and I see well into both short and long distances. This and the high quality work of the eye clinic basically made my decision for me. I would like to take this opportunity to thank everyone again for a very high quality care and professionalism.